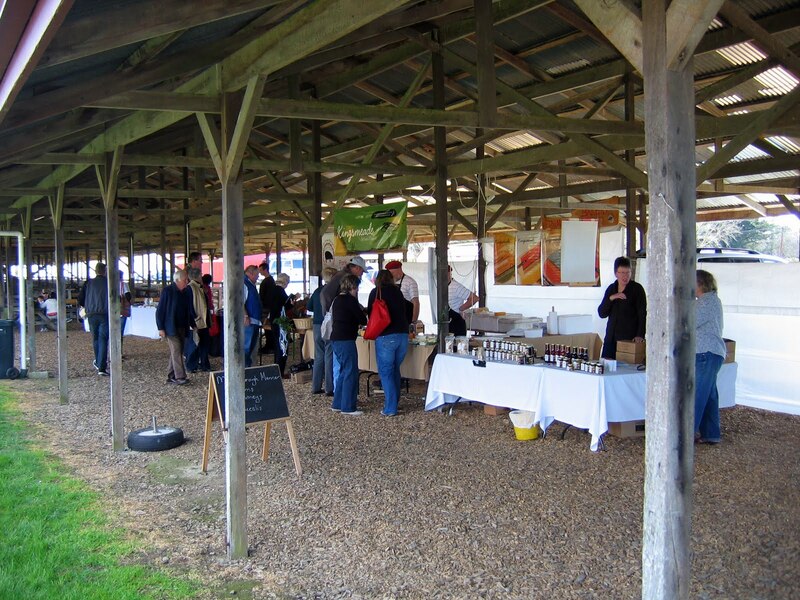 Wairarapa Farmers’ Market Guest post and photos by Good Food in a Crap Kitchen blogger, Stephen Garrett. It was an early start for us last Saturday (well early for a weekend). 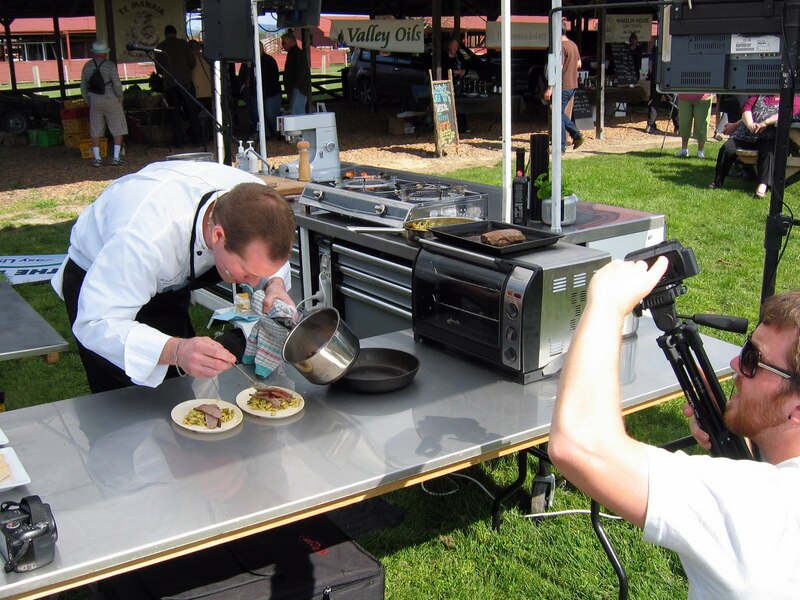 We drove up to Masterton to check out the market and see the cooking demo put on by Marc Soper. The drive was pleasant and the weather got hotter and hotter as we headed north. The market was quite intimate with about twelve stalls, so the tour didn’t take too long to see what was on offer. Small as it was there was a great selection of quality produce, excellent vegetables, rare breed pork, mouth watering breads, cheeses, olive oils, wines, preserves and so much more. It may not of taken long to walk around and see each stall, but the warmth and friendliness of the stall holders meant you spent time discussing their produce, instead of the Wellington market mindset, grab what you need and push your way through a crowd to pay. 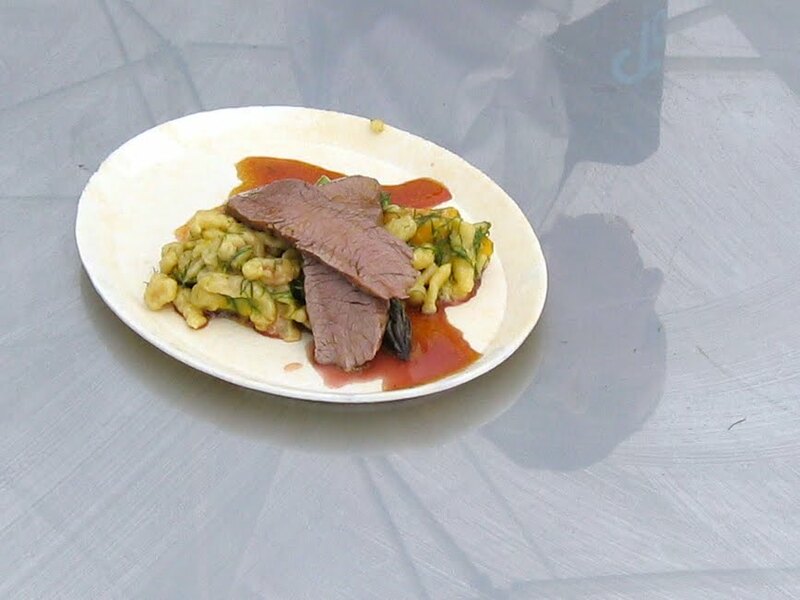 We had already a small bounty when Marc put on his first demo, Spätzle with Lamb loin finished with a pinot noir/olive oil syrup. He had a nifty little tool for scraping the Spätzle in to the boiling water, I have to get my hands on one, I usually use my potato ricer which isn’t the best. I love love love Spätzle and blue cheese and this dish had both. Luckily for me Sophie doesn’t like the cheese so much, so more for me! Heat pan, and add a splash of oil. Place all dry ingredients into a mixer, add wet ingredients and mix. If too wet add more flour, and if too dry add more milk. Have boiling water ready on stove and place mixture into a bowl with small holes, push through in batches into the boiling water, when it floats to the top leave for a minute and then remove and cool in cold water and drain. To cook the spätzli, heat oil in a suitable pan, add the spätzli and toss in pan, chop up the asparagus and break up the cheese and add to spätzli, season lightly. Heat the pinot and reduce by half with the honey till syrupy. Add olive oil and mix, and add salt to taste. Place spätzli on the plate with the cheese and asparagus. Slice lamb and serve on top and spoon over the syrup. Serve with your favorite farmer’s market green salad. The Second demo was a Wanton with a filling of Kale and Blue cheese with smoked garlic served on a Fennel and apple salad. These were really tasty and so easy to put together. They would be great for party finger food, and has found a spot in my recipe collection. Heat oil in pan; add kale and sauté till soft. Chop roughly. Mix with blue cheese and taste for seasoning. Place wanton wrappers on bench, and place spoonfuls in centre of each square, then brush all edges with some water, and fold over from corner to corner to seal, removing air as you go. Place on tray with some olive oil and bake in oven 5 minutes at 160 Degrees. Heat pan and add a splash of olive oil, add asparagus and pan fry a little just till softened. Season lightly and keep warm. Make a salad with finely sliced fennel and finely sliced apple and mix a little olive oil and seasoning into the salad, also you can add some fennel foliage if desired. 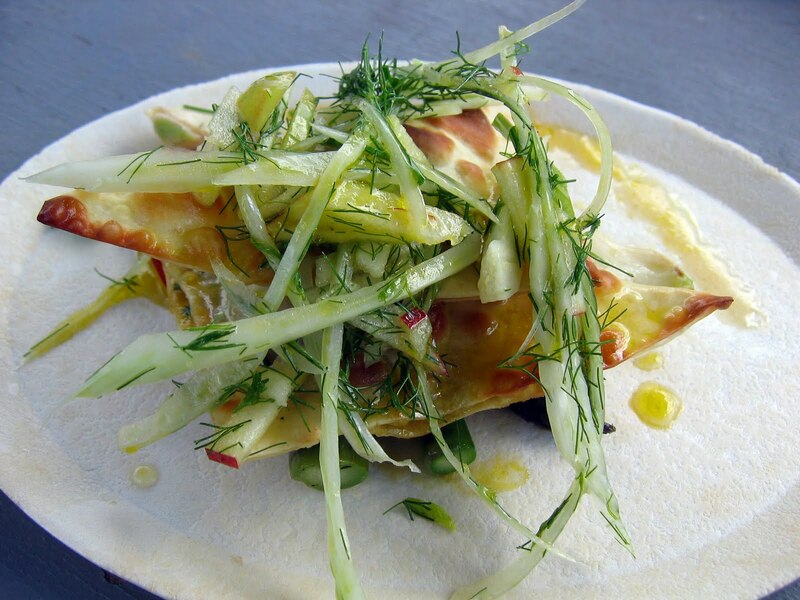 top with fennel and apple salad. Spoon over and around the dressing. We will be back to Masterton for this market, it’s a great day out of the city. – Thanks so much for coming by Stephen, it was great to have you there! And its definitely a very sweet market, the perfect setting really. We were amazed by Marcs’ spätzli, definitely something new and delicious that I may need to attempt one day… Many thanks to John and all the Wairarapa Farmers’ Market team for a great day. 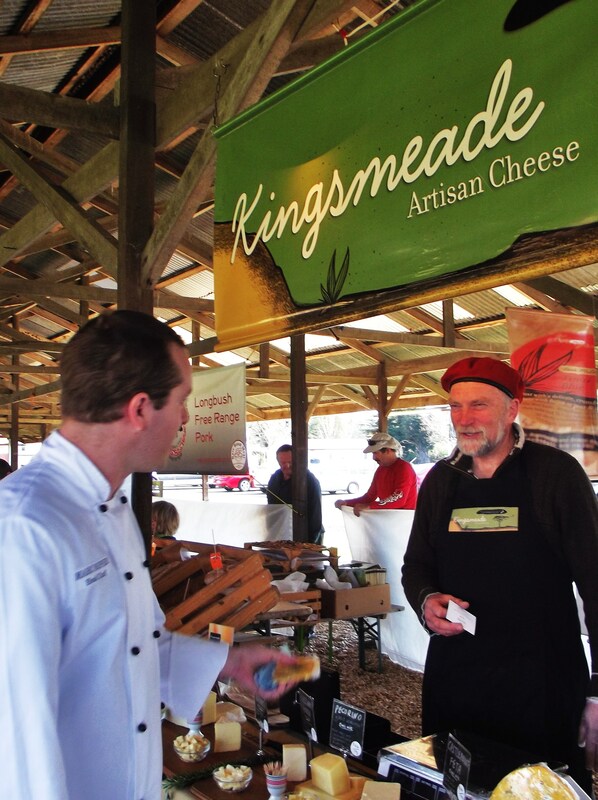 Check out the videos below, and we will catch you all next time when we visit Farmers’ Market Taranaki.